Most of us reach for a pill, take a vitamin supplement or visit the doctor for a prescription if we get a headache, catch a common cold or contract an infection. But what happens if there isn’t a quick fix? What do you do if you find yourself with a chronic illness like Chronic Fatigue Syndrome/M.E., or Fibromyalgia where there isn’t a straightforward remedy or diagnosis? After you’ve seen specialists, embarked on recommended protocols and cleared your work schedule, remember, there are some important things you can do to make your situation more manageable and support your long term recovery. Perhaps the first and most important thing to recognise is that stress makes everything worse. It not only exacerbates symptoms and hinders recovery, but undermines the emotional and mental resilience needed to cope with a debilitating condition. Crucially, it makes it harder to maintain the all important belief that things will change for the better. Chronic illness presents stress on a round-the-clock basis. There’s the emotional and psychological stress caused by being ill in the first place and the physiological stress illness loads on the body. Then there’s the everyday stress of anxiety and ‘negative thinking’ patterns, along with environmental, relationship and personal circumstance stressors. There’s the sense of isolation that can come from your mobility being limited, especially if you’ve become housebound, and the loneliness and frustration caused by those closest to you simply not understanding what you are going through. On top of everything, the change chronic illness wreaks across every area of your life imposes yet more stress. Conditions like Chronic Fatigue/M.E. and Fibromyalgia compromise the body’s Nervous System, leaving it highly susceptible to any form of stress. Everyday stimuli such as light, noise, interaction with other people and even thinking can lead to overwhelm and exhaustion. The bottom line is that no matter how much money you spend on specialists, supplements and treatments, unless the stress load on the body is managed, recovery will be an uphill battle. I, myself was ill with Chronic Fatigue/M.E. for almost a decade and it wasn’t until I approached my condition from a more integral perspective that I began to improve. This included learning ways to manage stress better so my body could get on with the business of repairing itself, and making some fundamental changes about how I chose to live my life. A combination of specialist nutrition programmes, psychology processes and daily meditation and mind/body practices led to my eventual recovery. For the past eight years I’ve been working with patients at a leading UK clinic that specialises in Chronic Fatigue/M.E., Fibromyalgia and related conditions. I teach them how to manage their symptoms and support their own recovery process through meditation and mind/body awareness practices. The results have been overwhelmingly positive, showing improvements in general outlook, symptom management and well-being. Patients notice they generally feel calmer, less tired, wired and anxious and find it possible to take a step back from things. By learning to monitor their state through mindfulness they can turn off ‘worry brain’, let go of negative thinking patterns and go more at their own pace. Headaches may reduce in frequency and sleep patterns improve. In time, many find they experience less sensory overwhelm and that their energy level and zest for life increases. Patients report feeling more positive about life and optimistic about their recovery. Most are able to develop deeper self-compassion and self-wisdom, learning to listen to their body’s needs and do things on their own terms and trust that recovery will come in its own time. The beauty of using meditation and mind/body awareness practice with chronic illness is that if offers a holistic approach to health and well-being. It supports the whole person rather than just target the symptoms. Scientific research in the field of Psycho-Neuro-Immunology shows a direct link between immune function and psychological processes. Chronic stress suppresses the immune system and generally makes life miserable. Relaxation and well-being, on the other hand, puts the body in its optimum state for healing as the primary role of the relaxation response in the autonomic nervous system is to restore the body to equilibrium so it can replenish and renew itself. When stress triggers the body’s ‘fight or flight’ mechanisms this natural healing state is blocked. Stress management, therefore, plays a vital role in the recovery process, yet is sometimes undervalued or even overlooked. Meditation offers a broad range of tried and tested techniques for managing stress. Its rich blend of practice and philosophy act as powerful antidotes to the psychological and physiological stress of chronic illness. As well as calming the mind and body, it provides a non-invasive means of working with unhelpful thinking and behaviour patterns and nurtures healthier levels of self-belief and self-esteem. All of this supports the body’s natural healing processes. The healing that meditation facilitates goes even deeper. It can gently address unresolved issues of grief or trauma and lighten the load these impose on the body, helping to dissolve the blocks they present in the recovery process. The true gift of meditation and mind/body awareness is that it operates on several levels at once, bringing about positive shifts in physical, mental, emotional and spiritual states. At the same time as easing symptoms of anxiety and physical discomfort, it provides a gentle means for self-development. These naturally therapeutic practices help to restore a sense of autonomy that is often lost during chronic illness. Learning to self-moderate symptoms, moods and mental and physical states through simple daily practice enables a person to regain a sense of control when everything has felt out of their control. To engage with the process of self-development is empowering, especially when the physical process of recovery is slow. And, because these practices involve the mind and the body working together, they create new neural pathways for desired physical and emotional states, and are capable of retraining thinking and behaviour patterns. Some people may notice, for instance, that their body has learnt to relax for the first time in many years. Others notice they are able to reassure and comfort themselves rather than feel a victim of their condition. My approach to working with chronic illness is to show how meditation and simple mind/body awareness practices can be used spontaneously in everyday living for a few minutes at a time throughout the day, not just in longer, ‘planned’ sessions. This brings the relevance of these practices alive and spreads their benefits, helping to sustain a more general sense of equilibrium. In time the skills can become second nature. Just as a combination of specialist treatments and approaches can offer the most comprehensive support for chronic illness and is more likely to take the individual into account, the same is true of meditation. In my experience, there’s no single approach that covers everything. As a meditation teacher and personal development coach, I draw from an eclectic mix of meditative traditions, including mindfulness, grounding, positive thinking, visualisation, gratitude and compassion, alongside mind-body awareness. I find they all work well together, complement each other and often overlap. I’ve developed a twelve week programme, Conscious Process to provide support for people with chronic illness through gentle coaching, guided meditation and daily awareness practice. It aims to give people the understanding and tools to manage their symptoms more effectively on a day-to-day basis and underpin their long term recovery process. 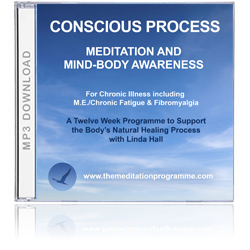 Conscious Process – An audio support programme for Chronic Illness, including M.E./Chronic Fatigue Syndrome and Fibromyalgia.